The people, places and passion that drove 60s Birmingham on through rock 'n' roll's finest decade. ISBN 0-9536951-5-8 Published by TGM Ltd. 2003. Following in the tradition and standards established by Laurie Hornsby's brilliant first book Brum Rocked!, the follow-up volume Brum Rocked On! has a lot to live up to - but does it? The answer is DEFINITELY! Biased though I may be towards the book's subject matter, it's no easy job to tackle such a complex project and have it all fit together into a highly readable format which Brum Rocked On! definitely achieves. While Brum Rocked! was about 130 pages, Brum Rocked On! weighs in at almost 300 and even this was likely a tight squeeze considering the hundreds of bands who are covered. Almost every page has rare and previously un-published photos - many expertly restored by editor Mike Lavender - and come from the contributors' private collections. Laurie Hornsby is the author of some well known published works about local history and culture. He is a writer, performer, musician and songwriter, and recently added 'playwrite' to his list of accomplishments as the co-writer of the theatrical production Wallop Mrs Cox which was performed successfully in Birmingham to critical acclaim. 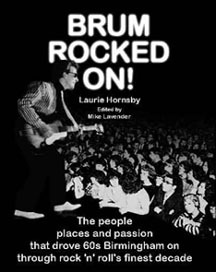 Laurie Hornsby's experience as a member of Raymond Froggat's band during the 1960s and 70s as well as his intimate knowlege of the local music scene of those days has thoroughly qualified him to write Brum Rocked On! as it documents Birmingham's music scene through the "glory days" of the 1960s. Mike Lavender's 1960s career as a member of Frosty Moses - a local band who almost made the big time - is also revealed in Brum Rocked On! While Brum Rocked! (published in 1999) dealt with the early development of Birmingham's music scene from the mid 1950s up to about the mid 1960s, Brum Rocked On! continues from where the first book left off and documents the formation of the loads of new bands and performers up to 1970 - some of whom would become very well known internationally, and many whose influence continues to be felt upon the world's popular music and culture to this day. Just a few examples from Brum Rocked On! are stories like the day in 1964 when a Brum group The Chads, were auditioning in an Acocks Green scout hut for a new lead guitarist. After the auditions, they had started to pack up when an applicant arrives late - soaked to the skin with his guitar after hopping buses all the way from from Shard End during a rain storm. Feeling sorry for the young lad, the Chads set up again and give him a try-out. He turns out to be brilliant so the band hire him on the spot. That's how Jeff Lynne (of E.L.O.) joined the Chads! An example of another great story from Brum Rocked On! is when local singer Pat Wayne hires a young John Bonham to play drums in his backing band. John borrowed his father's window cleaning van to transport his drums to the first booking at the Golden Diamond Club in Nottinghamshire. Unfortunately they get into an accident on the way and John rolls the van into a ditch. Undaunted, the band piles a shaken up John Bonham and his drums into their own Bedford van and continue on to the gig. "We had 30 watt amplifiers and, at the start, I had a voice," recalls Pat. "John's drumming was magnificent, but it was a sheer powerhouse of volume. We couldn't make ourselves heard above it all. The manager of the Golden Diamond commented that the Beachcombers had become a 'drum show'." Readers who are fans of The Move, Spencer Davis Group, Moody Blues, The Fortunes, The Rockin Berries, Black Sabbath, and Led Zeppelin will find lots of information in Brum Rocked On! about the early days of these bands. The visits to Birmingham of other well-known performers are also documented - legends such as Buddy Holly, Eddie Cochrane, Gene Vincent, The Beatles, and many others who influenced the development of pop music in the West Midlands. Just as important though, is the many and varied stories which are told of those performers who did not become household names but without whose participation and influence, there could never have been such a thriving local music scene from which so much talent has emerged. As the Birmingham Mail's Andy Coleman stated "If you were a budding pop star in Birmingham between 1963 and 1969, you're probably mentioned in this book." As with Brum Rocked!, Brum Rocked On! also documents hundreds of pubs and clubs throughout the West Midlands where all these bands performed. Classic venues like the "Plaza" Ballrooms in Handsworth and Old Hill, the Belfry - Wishaw, The Mackadown - Kitts Green, and well known Birmingham locations such as The Moat House club on Bradford Street, the Golden Eagle Pub on Hill Street, and The Ritz Kings Heath amongst many others. Later venues also documented include places like The Elbow Room on Aston High Street, the Midland Arts Centre at Cannon Hill Park, Henry's Blueshouse (above The Crown) on Hill Street, and the legendary and influential Mothers Club in Erdington (formerly the Carlton Ballroom). Who would have known that Carl Wayne and The Vikings on Christmas Eve, 1965 played their final gig at Selly Oak's Station Pub - now called "The Bristol Pear" (why can't the original historic names of these places be retained? ), or the Moody Blues (as the M&B Five) played their first booking in 1964 at The Mackadown pub for a fee of 10 pounds! Brum Rocked On! is organized into chapters from 1963 to 1969 and comes with a well organized index which makes it easy to find the bands you are interested in. This also makes the book a great source of reference you will find useful for years to come. If you remember or participated in Birmingham's music scene during the 1960s, or are just interested in the bands and performers from that time you will definitely like this book.